Tattered and Inked: Superhero Printable Banner!!! So I'm back for our last little get-together for the day!! Remember this set-up from my superhero party?? I wanted a cute banner to hang from the cabinet door backdrop but didn't have a lot of time to get one made. So I decided to design a quick printable one and I looovvee it. It was super quick to get done and didn't lose any of the cute factor just because it was printed. 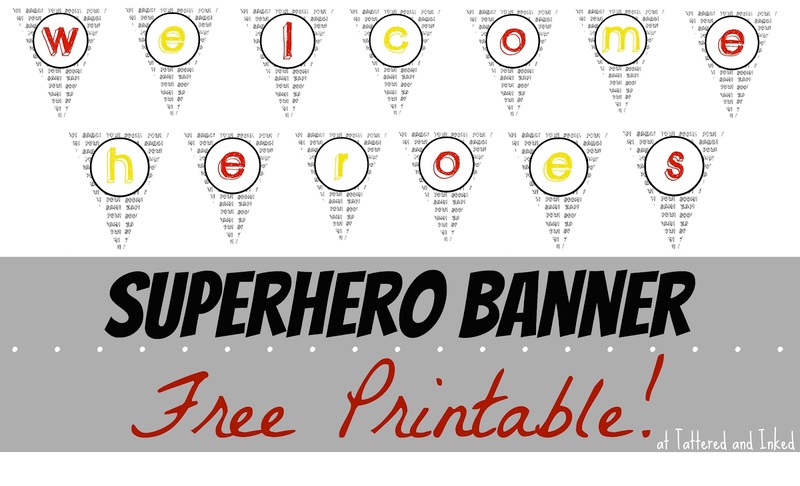 I spelled out "Welcome Heroes", printed out each banner seperately and punched holes on either side of them at the top. I used twine to string them from the cabinet doors. And you know I wouldn't leave you hanging, right? So I'm including links to download each letter. Make sure you get enough of the ones you need- the e's are both used twice and so is the red o.
I printed mine as 5x7s so I could fit two per sheet of cardstock. 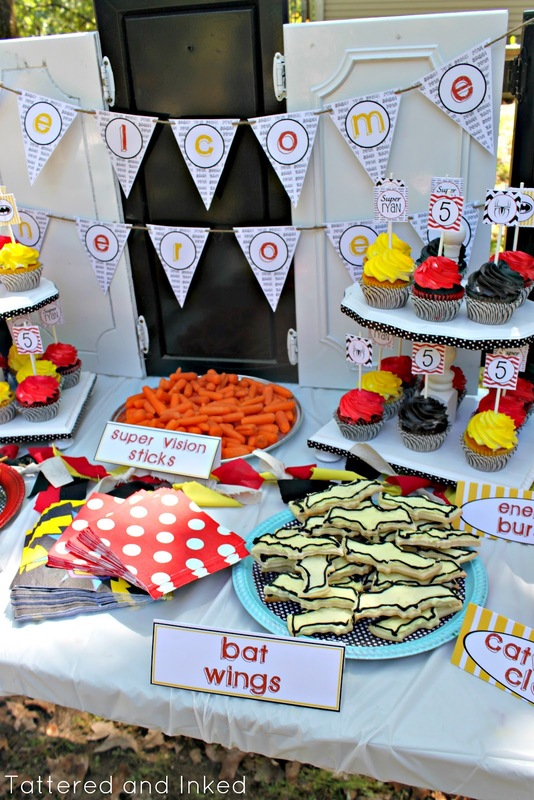 I so hope you enjoy using these printables!! 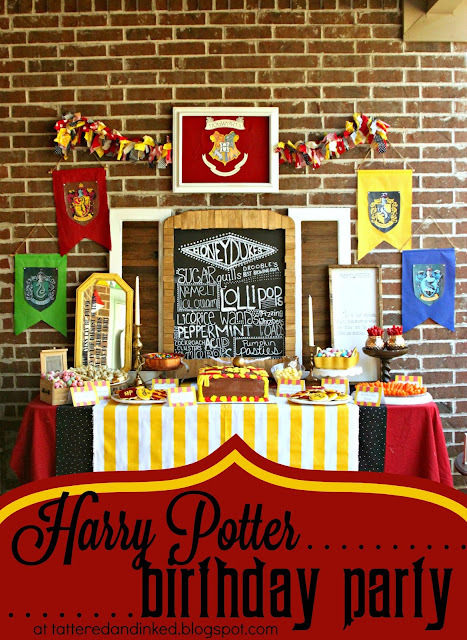 What are your thoughts about using a printable banner? Does it lose too much of the cute, handmade factor to you? I'll be back tomorrow with some more superhero fun!! 'Nite guys- I'm off to study for my LAST final!! OMG - you did a superhero momma job!!! So so awesome! As always, you are so creative and everything turned out so great! I know your big boy superhero was so happy! Thank you so much for these printables! 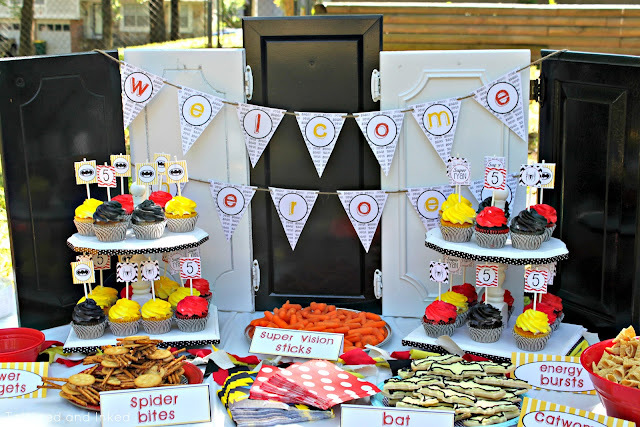 For someone who is creatively-challenged, you have helped me to make my party planning so much smoother! Blessings! Thanks a ton for sharing your hard work with those of us who don't have a cute/creative bone in our body! I appreciate it so much!! God bless you!